We have thousands of properties for sale all over France. But we've no property for sale in Angers at the moment. And that's something we want to change. If you have a property to sell in Angers (or nearby) then act now to get a 50% discount. Just place your advert in the normal way (Click here to place your advert). Then send us an email quoting "Angers" and telling us that you you saw this offer. Angers is the capital of the Maine-et-Loire Region in an area known as the 'Garden of France'. It stands proudly on the River Maine with the old town on the south bank dominated by its formidable castle. Although important in both English as well French history, it has much to offer the person of today. 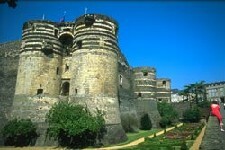 Angers was founded by the Romans. In the medieval period was the centre of power for the Dukes of Anjou who with George V gave rise to the Plantagenets. The castle became the home of Henry II of England and his royal family. Louis IX developed its defences with an incredible outer wall including 17 massive towers and moat, which forms beautiful gardens today. The old town is noted for its enormous 14th century Apocalypse Tapestry, 12 & 13th century cathedral, 17th century monastery and it Renaissance mansions. Unsurprisingly, due to its history, Angers offers a lot of museums and galleries. However, it offers much more with modern collections of art and contemporary tapestry. It has a big student population with two universities and many institutes which provide places for over 30,000 students. Secondary education is supported by around 20 colleges and lycees. For those interested in sport, there are over 150 sport clubs which enjoy the wide variety of facilities for gymnastics, swimming, tennis, etc. As a centre of culture, many events are organised to include concerts, dances, cinema, conferences and exhibitions. This makes Angers a town that is as relevant today as it has been in the past. The local economy is vibrant with many employment opportunities. Business activity includes technology, banking and tourism as well as the traditional industries of textiles, horticulture, wine and spirit making - Cointreau being its world famous liquor. Angers is well located being on the A11 motorway. Flying is now also easier, with Eastern Airways servicing Angers. It is also readily served by the airports at Nantes (Ryanair, Aer Arann) and Tours (Ryanair) as well as by the TGV rail service from Paris. Angers is a large thriving and cosmopolitan city - so unsurprisingly it has a very active property market. It is also a popular tourist destination with good transport links. Prices are higher than surrounding areas in Maine et Loire but compare favourably to other popular cities in surrounding departments. Do you know Angers better than we do? 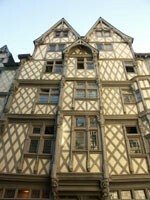 Do you have photos of Angers? Angers is in the centre of the Maine et Loire department. Access: Angers is well connected, with its own airport and nearby airports at Nantes and Tours, as well as a TGV link to Paris. Economy: A mix of traditional and modern with agriculture, tourism and technology all playing their part. Interesting fact: The sweet orange Cointreau was created in Angers. You can tour the distillery near the city and finish up with an enjoyable tasting session.